Lions are most commonly placed at the top of the food chain, with a preference of large mammals, such as wildebeest, impalas, zebras, buffalo, wild boar and warthogs. When hunting together lions can take down fully-grown healthy adults of most species, such as a male giraffes or elephants, however they tend to avoid the largest species due to the risk of injury to themselves. 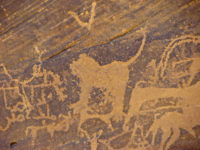 Interestingly, lions are most common in the later phase petroglyphs, and tend to appear in close proximity to camels. 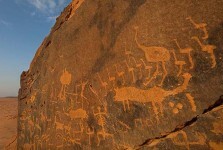 After the Holocene Wet Phase ended and the aurochs disappeared, the camel would have been the biggest prey for the lion. 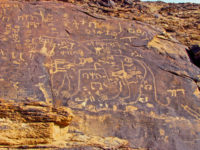 Camels would have provided fairly easy targets, and lions would not have had to compete for such large prey with leopards or cheetahs as they would for smaller game. 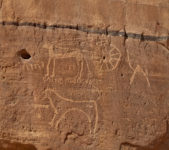 The depictions of lions may have reflected the fear Bedouin pastoralists had for the safety of their herds, as well as their own communities. 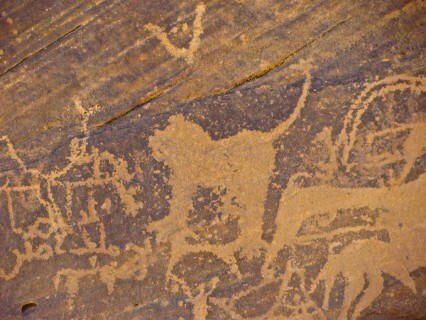 They are shown being hunted with spears. Lions are most often found in dry savanna grasslands, although they can inhabit bush and forests. In the savannas, they prefer areas with scattered trees that provide shade. Until the close of the Pleistocene, lions had the largest distribution of any land mammal. Greece and the Middle East were once riddled with lions. 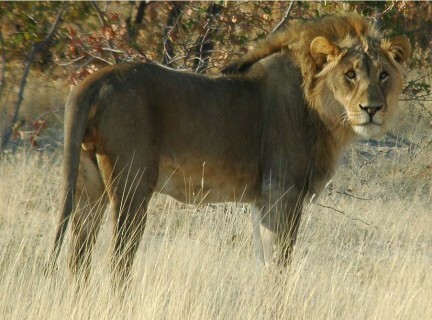 The lion has vanished from most of its range, now only inhabiting sub-Saharan Africa and the Gir Forest of Guharat, India. Humans have long been the lions’ largest threat.